If you're looking for a small luxury sport sedan with a wonderful blend of style, power and performance, then you'll be delighted with the 2017 Jaguar XE in San Antonio TX. Possessing a vigorous engine, lightweight platform, smooth ride, superb handling, and an abundance of high-tech features, the new Jaguar XE will take your driving enjoyment to a whole new level. This spectacular sport sedan will arrive at Barrett Jaguar in March 2016, so if you'd like to get your hands on the 2017 XE, then be sure to get in touch with us. 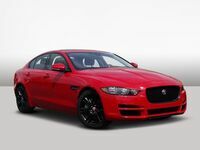 We're excited to show you this outstanding new model from Jaguar. The sleek exterior design of the new XE certainly commands attention. The sweeping silhouette is inspired by the aerodynamic lines of the superb Jaguar F-TYPE. Its long hood, short rear and strong rising waistline add a sense of drama and movement, even when the XE is standing still. The sculpted hood sweeps back from the available distinctive 'J-Blade' HID Xenon headlamps, channeling air over and around the body, minimizing air resistance. Designed using state-of-the-art computational fluid dynamics, the XE's seamless sports sedan profile creates minimal drag. The XE feels as good as it looks. The 2017 XE comes with a supercharged 3.0-liter V6 engine that delivers an outstanding 340 horsepower and 332 lb-ft of torque or a 2.0-liter four-cylinder turbodiesel with an expected fuel economy of 37 mpg combined. With superior driving dynamics, lightweight aluminum structure, advanced double wishbone front suspension, you are in store for supreme driving enjoyment. The available Autonomous Emergency Braking system gives you an audible and visual warning if the XE forward camera senses a potential collision. If you don’t take evasive action, the car is designed to brake automatically to reduce the impact. Adaptive Cruise Control uses radar technology to automatically adjust your speed to match the vehicle ahead, while the Blind Spot Monitor uses radar sensors to cover areas difficult to see when you’re driving. The XE is filled with technology to keep you informed, entertained connected, with intelligent driving aids constantly working to help you focus and relax. All the while, the advanced Jaguar InControl infotainment system ensures you’re always intuitively connected - whether that’s to the business world, the virtual world or simply your world inside the XE. The beautiful styling extends to the interior of the 2017 XE, giving you and your passengers an atmosphere of luxury and sophistication. The cabin also offers outstanding levels of comfort and spaciousness. Exquisite materials and finishes combined with Jaguar craftsmanship make this a class-beating interior that’s unlike anything else in the segment. Jaguar’s new InControl Touch infotainment system takes center stage: its innovative 8-inch touchscreen brings fast, intuitive access to all features and functions – and iOS and Android smartphone apps. Whether it’s the beautiful exterior, sophisticated and comfortable interior, superb performance or excellent tech features, there's much to love about the Jaguar XE. First of a new generation, the 2017 XE is built to exceed all expectations of a compact luxury sport sedan. If you'd like to learn more about the new XE or wish to take one for a test drive, then don't hesitate to contact us here at Barret Jaguar. We truly look forward to showing you impressive capabilities and exceptional features of the 2017 Jaguar XE. 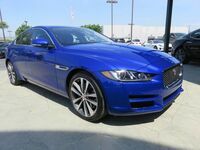 Interested in a 2017 Jaguar XE?